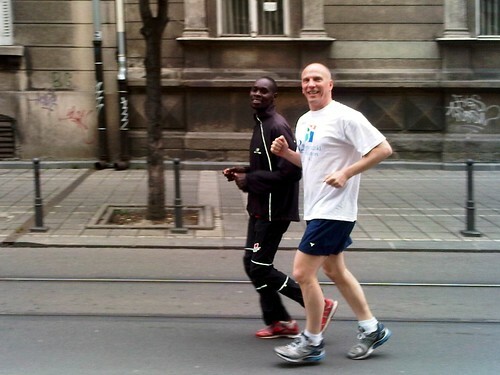 I am warming up with Marathon Runner-up, Henry Kipyego. I ran the Belgrade Marathon, well, at least the half marathon, for the third time and I had my best time of 1 hour and 49 minutes exactly (officially 1hour, 48 minutes, and 56 seconds). I started extremely fast this year with a 23 minute 5 km and followed with a 24 minute second 5 km. My official split at the 10 kilometer mark was 48:46. I slowed in the second half of the race with a 26 minute third 5 km. At the 15 kilometer mark I had a time of 1 hour and 14 minutes. At the 1 hour and 22 mark, the 1:45 pacer ran by me. I hung on for about 3 minutes, but couldn’t keep up. The last 5 km was painful! I saw the clock finally and wanted to get under 1 hour and 50 minutes. I made it with a time exactly 1 minute faster than that. I finished in 384th place out of 1,535, which is in the 25th percentile! Overall it was a great race and I enjoyed it. Nadia, my wife, ran the 5 km fun run. There was too many people and she felt the course was a bit longer than the 5 kilometer. She finished with a time of 27 minutes. I was inspired to run a 5 km run with the kids next month. There is a run in the Košutnjak Park on Saturday May 19th which we hope to run. The blog posts to my prior Belgrade Half Marathon runs can be found here, here, and here.